Colour Review: Sherwin Williams Big Chill is a BIG DEAL! You are here: Home / The Best Paint Colours / Neutral, Gray, Greige, Cream and White / Colour Review: Sherwin Williams Big Chill is a BIG DEAL! Big Chill SW 7648 – Undertones, LRV and More! While all of Pinterest has been paying homage to the warmer end of the gray world with colours such as Sherwin Williams Repose Gray and Benjamin Moore Revere Pewter, there has been one colour that has been laying back, waiting patiently for it’s time in the sun (or in the shade more appropriately) and its time has COME! Sherwin Williams Big Chill. This soft, cool-toned gray is one of the top 5 paint colours that I refer to in my online colour consulting. With the majority of my clients looking for warm and cool gray tones, it really is as close as we’re going to get to the ever-elusive ‘perfect gray’ (which doesn’t exist btw). Why doesn’t the perfect gray exist? Well, because there is NO SUCH THING as a fail-proof neutral (BOOM – the bubble is officially burst). You know, that ONE COLOUR that works everywhere, every time? Nope – it’s ALLL a lie. There are so many things to take into consideration, such as exposure, flooring, countertops, light bulbs, personal tastes and how much wine you’ve drunk – that a colour that is PERFECT for one room can be terrible in another – just based on a change in environment. Anyway, let’s get back to Big Bad Chilly. If you like cool grays, you’ll like the undertones of Big Chill. If you prefer neutral grays you ‘might’ like it (50/50 chance) and if you prefer warm grays – you need to get the heck outta Dodge and go to this blog post instead. Why? Because Big Chill is coooool baby. Big Chill has a very passive blue undertone. Now some blue undertones are more crisp and icy or they have a bit of green in them. 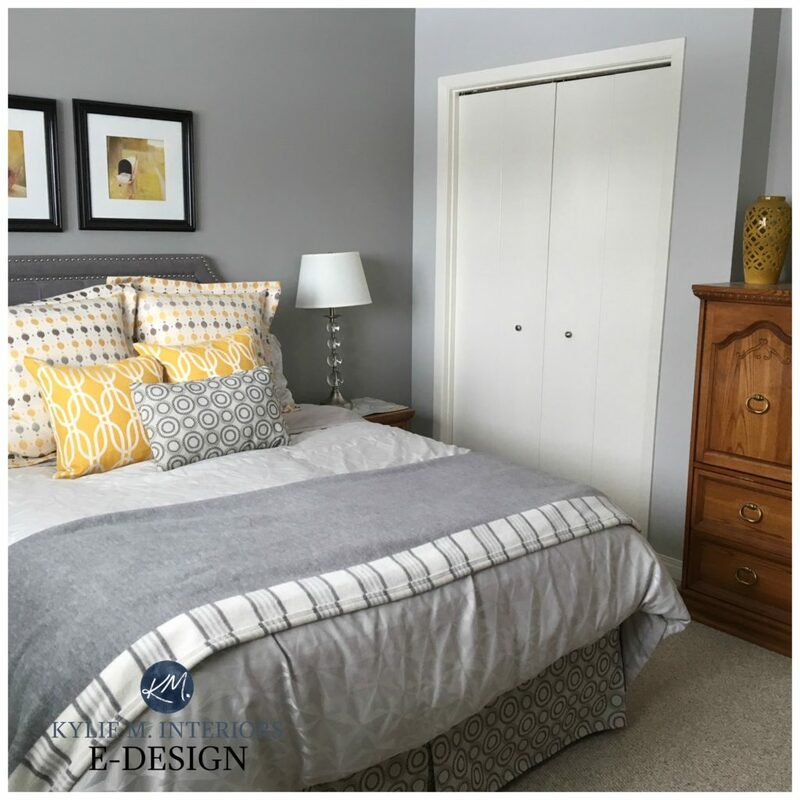 This beautiful gray has more of a slight stormy blue look, with undertones that are virtually unnoticeable. See how lighting can play a BIG part in how a colour looks? The picture on the left, with the lights on, shows how Big Chill can flash that cool look. The photo on the right with lights off shows Big Chill at it’s natural best. With an LRV of 62, Big Chill is considered a light colour. Now there are light colours that can totally wash-out when hit with a lot of natural light and light colours that lean to the heavier side. This one sits RIIIIGHT in the middle. It will hold itself well in a darker, more shadowed room (that has enough artificial light) as well as a reasonably well-lit room, only washing out a bit at the height of the day. While there are always other factors to consider, you can expect Big Chill to look that little bit cooler in a north facing room as the gray/blue light filtering in slightly enhances the cool tones of this colour. 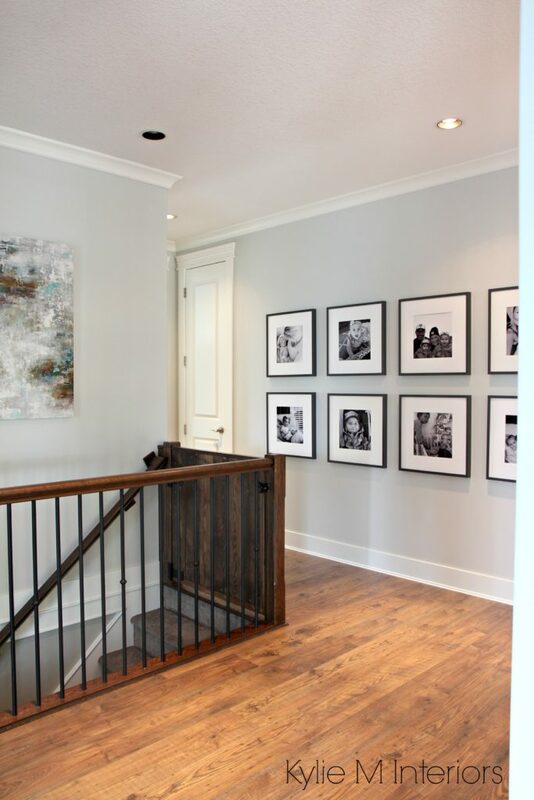 In a room with southern exposure, it may wash-out a smidge at the height of the day, but most of the time it should act like a soft, cool, but generally neutral gray. If you like the idea of Big Chill but want a bit more body, of course, you can darken it by 25-50% OR you can check out ANOTHER cool beauty called Silverplate SW 7649 (be still my beating heart…). Silverplate has an LRV of 53 so it has some more weight to it, while still offering that beautiful silvery gray look. You can also jazz Big Chill up with the use of a feature wall. Check it out in this GORGEOUS bedroom. MAD LOVE! 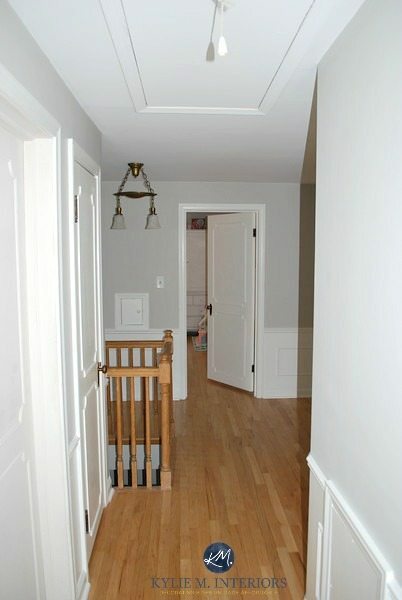 Big Chill is pretty comparable to Benjamin Moore Stonington Gray. You’ll see that Big Chill is a bit lighter and ALSO a bit more ‘neutral’ looking, whereas Stonington has just a bit more of that stormy blue undertone. If you prefer the depth of Stonington Gray, you could darken Big Chill by approx. 25% and it would bring it closer to the same shade. Big Chill is also in the running with Benjamin Moore Gray Owl as one of the TOP cool gray paint colours. Compare the 2 and you’ll see how Gray Owl can pick up just that touch of green (as well as blue) undertone in comparison to Big Chill. Big Chill MIGHT pick up a green – if you have grass, trees or Kermit outside your window which can reflect their green tones slightly onto the walls. There are SO many beautiful grays to choose from! Deciding which one is BEST for you and your home involves looking not just at your exposure and landscaping, but also at the hard and soft surfaces of your home such as flooring, countertops, linens and of COURSE – personal taste! Need help picking YOUR perfect gray? Check out my affordable E-décor services! Love this helpful breakdown on color selection! It’s quickly becoming apparent that I need professional help picking out color for my new (not terribly well-lit) condo. Also love that light fixture in the second pic above the dining table!! Can you reveal where that’s from?! Hi Suse, thank you for the note! Unfortunately, that was my clients choice (via E-design) so I’m not sure where the light is from, but I do know that Wayfair has a GREAT selection! Love your reviews. If you are taking suggestions, would love to see a review of Sherwin Williams Riverway – thinking of doing the dining room in this color. Thank you, this is exactly what I was looking for. I want a cool and fresh gray for my open floorplan, I was almost ready to go white. The walls are all connected and visible from anywhere in the main floor so I want all the same color (I have different accent colors now on the center wall, which does not go to the ceiling, and hate the chopped look. What white trim goes best? North south east west facing I have it all. Hi Karen, I’m glad it helped! As for white, I’d be keeping it simple with something like SW Pure White! I have light wood floors like the above photo but all my windows and interior doors and stairs are light wood as well. My question is if I use this paint will it work with a sage green couch in the Family room. My kitchen is the biggest problem as the countertop is Karadon in sage green color with a blue undertone to it. I’m having difficulty finding a color that will work without competing with the counter the cabinets are light maple. Will this color on the walls conflict with the countertops? Any suggestions would be extremely helpful. Hi Alison, thank you for the note! Due to the amount of questions/emails I get in a day, I do need to refer personal questions to my e-design packages. They are affordable and fun! This way I can see photos/questionnaire and come up with some colour ideas/info that suit your particular space. I love your color advice and always google you first with any color color I’m considering for my home, or a house I’m flipping, hoping you’ve reviewed it. I painted my living room Big Chill last winter (unfortunately you hadn’t reviewed it yet), but I have to say I love it! 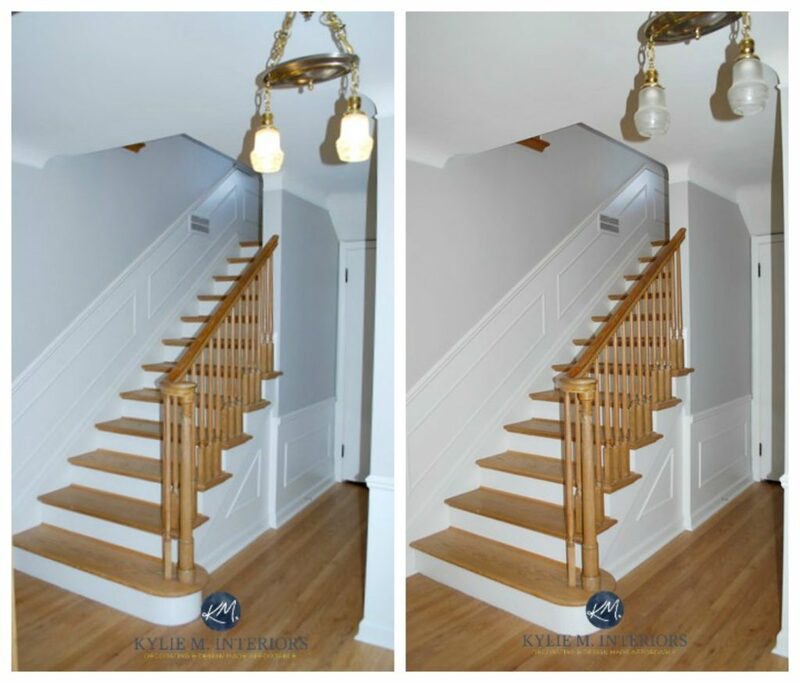 It’s a great color if you are looking for that seemingly impossible to find blue gray that doesn’t turn baby blue when you get it up on the wall. I went through five samples before I found this beauty. The light enters our living room from the west, and most of the day it reads as a pale blue gray (but not in your face with the blue) and at certain times a true gray. It’s pretty no matter what, and it definitely brightened up our space compared to the dark beigey color that was there we bought the house. What a great note – thank you! It’s input like this that helps other readers decide whether a colour could work for them – I’m so glad you’ve found my site handy! Thank you for this review! It may be my answer 🙂 I’ve read MANY of your color reviews and think this may be perfect. I have a fairly open floorplan and have painted my kitchen/family room with SW Rainwashed. 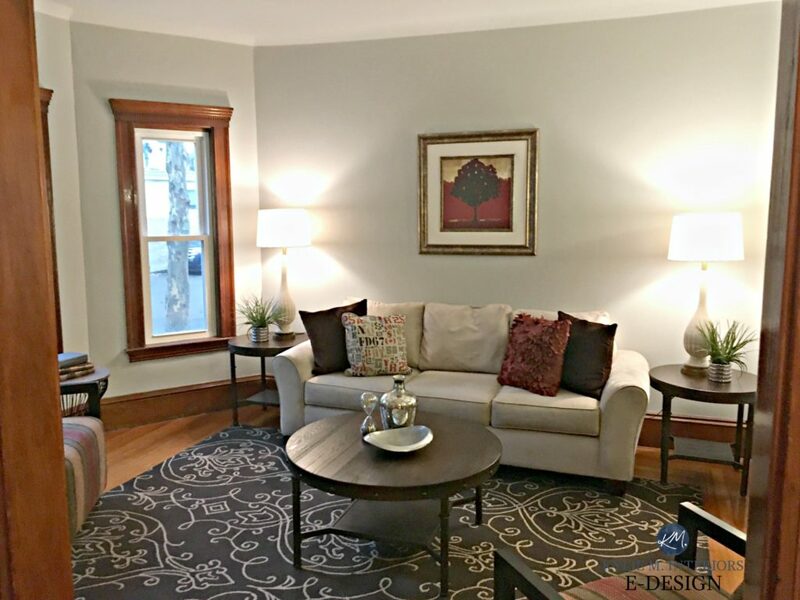 Now, I’m looking to paint my formal living/dining room a complementary gray color. The rooms are divided with an archway that I have painted a Swiss coffee. Would Big Chill be a nice complement to Rainwashed? Hi Melissa – absolutely! They both have that cool appeal and fall into a similar family you’re good to go! I just painted my son’s room Smoke Embers by Benjamin’s Moore (color matched by Sherwin Williams) but I see strong lavender undertones. I am wanting to repaint it and thinking about SW Silverplate. What undertones should I be aware of with it? Hi Abigail! Yes, that can happen with Smoke Embers as in the ‘gray’ world it leans more to the purple side than the blue/green. I actually LOVE Silverplate. It has just a very vague blue undertone, but it’s not too icy. I find it’s more what people ‘expect’ when they think of a typical gray colour. I made a mistake and used the Big Chill in my great room and in half of the room it reads a purple undertone. It looks best with natural light and stay away from reddish orange tones because you willl see a lavender hue. Hmmm, that is odd for Big Chill, if anything it’s cousin On the Rocks would be more inclined to do that – thanks for letting me know! Thank you for this article. I had been looking at Big Chill, and then googled the name and found your article. Your thoughts and photos confirmed this was the color for my newly renovated bathroom. I just LOVE it – I am not a huge fan of the all-neutral color schemes that are so popular now, because I love color and colorful art, but Big Chill is fantastic. It is soft and goes with so much. It is not icy or blue (north facing windows), and not a blah grey at all. It complements my ceramic ‘calacatta’ tiles and trim in “SW Pure White” perfectly. I painted my cabinets a smoky blue – “SW Bracing Blue” . I am enjoying your other blog posts too. Very informative! Well that is a great note to get – i’m glad the info came in handy! Hi! Have chosen Big Chill and Pure white for walls and trim. Would Pure White also work if I continued it on the ceilings and cabinets? Great blog and informative. Thanks for any help you can give. Yup! Pure White would look lovely with Big Chill! Hi. We were debating between BM Harbor gray and grey owl for our son’s room(5 yr old) that’s north facing withh very terrible natural light. The room looks dark and dull. Somehow came across Big Chill and love the color. We are now planning to go with Big Chill on three walls with SW “Scanda”, a blue shade as the accent wall. Hoping this will go for years to come as it’s a color a boy of any age will love to have or can live with😀.. 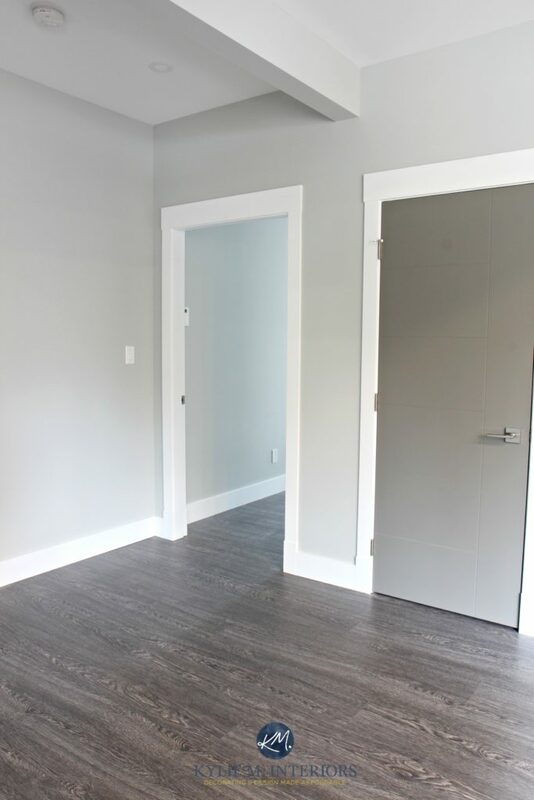 I know you recommended Pure White for trims, ceiling and door but I was wondering how Extra White will go with this color, or for all the doors/trims for that matter. What’s the biggest difference between Pure White and Extra White? Thank you so much. After we decided, the first thing I did was to come to your site to see if you have reviewed this color. So happy to see that it’s one the color you love. Thanks again. LOVING your blog. I’m officially obsessively checkonf LRV now! I’m planning on going with Big Chill for our kitchen, foyer and upstairs hallway. But will a cool gray like this work with Beige carpet? Or should I go with something warmer like Repose? Hi Lori, I’m glad it’s helping! Now there are many different types of beige, but off the top of my head I’m inclined to say that it MIGHT be a touch too cool and a slightly warmer gray might be a better choice…I wonder if even SW On the Rocks might be an interesting thought as it takes a touch of the blue out. I read tons of your blogs and plan to use big chill in my open floor plan dining room, it’s north facing and has tons of walnut stained furniture, I used mindful gray before, it literally made me depressed, do you think big chill will do better job in this room? Well, I’m usually hesitant to recommend too much without seeing a room, but it sounds to ME like this could work for you. Mindful Gray, being a warm gray is a bit of a heavier (some might say drab) feeling. Big Chill is by far more fresh and cool and ‘should’ do a much better job for you! Hi I change my mind after saw your living room. I decided to go with Alabaster with a naval accent wall! I just wanted to tell you how helpful this post was in choosing a paint color for our beach condo. I feel like I owe you a free night, or week! It was a tired yellow that I’m sure was the bomb diggity in the 90s. I needed to paint the entire place in one color, that would hold its own in the light and in the dark. At first I fought Big Chill because I thought it would be too dark., Based on the samples I painted. Boy was wrong! When we got back down there after they painted it, I was in love.. It’s so beautiful! I wish I could attach a before and after pictures for you to see. Thank you for your blog – you are the best-est! This is just a fantastic note! I recieve so many questions in a day that it was just AWESOME to read your note – THANK YOU! And seriously, I’d LOVE to see it (you can send it to [email protected]) If it’s clear enough/quality I could even use it on my blog – you’d be FAMOUS! You can seriously send as many photos as you like as I LOOOVE flipping through and seeing (and I can always edit to a degree). Hi Kylie! Which ceiling color would give a more modern feel to Big Chill, Pure White or Extra White? Hi! Big Chill can suit both. Pure White has a weee tiny wink of warmth in it, but it’s barely noticeable. It would contrast ever (like ever) so slightly with Big Chill. Extra White is more clean/crisp/cool, but I can’t say which one is more modern or makes the most sense with your home in particular – both are valid! The wife and I took the plunge and decided to do Big Chill in the whole interior of our home; including the ceiling. Now we’re thinking to add contrast and have the ceiling be a white. Does anyone have a recommendation on a great coordinating white that will complement Big Chill? Hi Damian, good choice! Now if you want a clean look, hit SW High Reflective White. You can also check out SW Pure White which has literally 1 WINK of warmth in it, just enough to stop it from being totally white, really. Hope that helps! Hi, Kylie! I’m so pleased to have stumbled on your review. We are building a new patio home – very open plan. I had already selected Big Chill for the whole house with white trim – there are wood floors (natural finish – very light) throughout except bedrooms & bathrooms. (I’m putting gray carpeting in bedrooms). Now I need to purchase area rugs and upholstered furniture for the living room and sun room…any suggestions on color to gravitate toward or to avoid? Thank you so much for your thorough reviews! I spent weeks trying to pick a color for the majority of the walls in our new house (that I hadn’t seen in person). It’s easy/west light with a LOT of honey oak in it. We redid the kitchen cabinets in white, painted the built ins SW Peppercorn (which look great) and used big chill on the main room, kitchen, dining, hallway, master bath and two bedrooms. Big chill is perfect! It’s light, so when the sun is shining in it does wash out a little, but it’s such a versatile color. In the evening it’s the perfect gray, in different rooms it has a touch of blue or the faintest purple. But I love that it’s light enough to not be a drag. It looks crisp and clean and definitely toned down the honey oak.